Due to the fact that the summoning portal was very unstable at the time of Razael's summoning he ended up way more intelligent than his demonite brethren. He is calm and calculating, seems to have a plan for most possible outcomes. Razael was the last Demonite to be summoned through Mozenrath;s monster summoning portal before the demon king absorbed it in an attempt to defeat the magical girly boys. After the defeat of Mozenrath, Razael found the left over spirit of his leader and a pearl that emanated the same aura as the summoning portal. This pearl is in reality a pocket dimension. Razael used the pearl and sealed Gaki's brothers within it in order to cause Extreme emotional stress to Gaki. once Gaki was in enough emotional stress he bound the left over spirit of Mozenrath To Gaki effectively corrupting him and turning him evil. A white mask with a creepy big smile, This mask cannot be taken off. 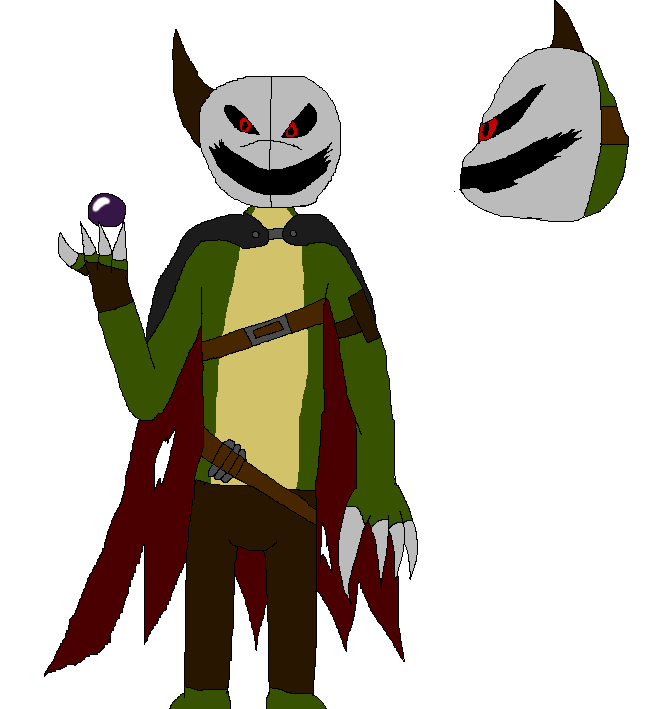 Here is the villain that takes becomes the big bad after Gaki and his brothers defeat Mozenrath.